Tracey, first I want to thank you for taking the time to speak with me. As you know, Casino Life Magazine takes great pride in interviewing leading industry CEOs and Senior Level Management members to better understand both the companies that they work for or own, as well as what the key attributes are for their success. Please tell our readers about yourself and your role at TransAct. Thank you, Victor, I appreciate your kind words and the opportunity to share with your readers. 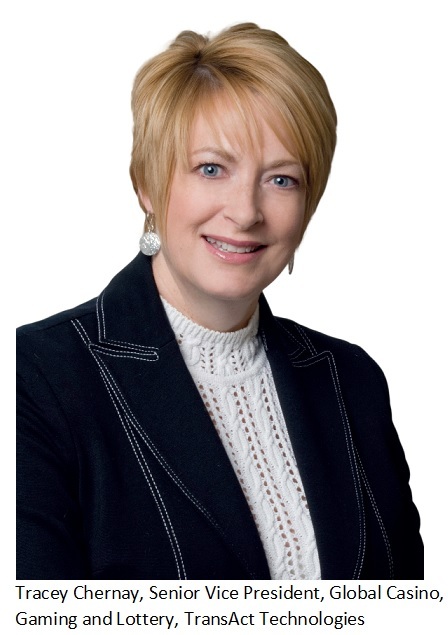 I serve as the Senior Vice President in Global Casino, Gaming and Lottery at TransAct. My responsibilities include developing and executing TransAct’s global business strategies for our gaming sales division, including product development, sales, and marketing planning for our Epic line of printer hardware and Epicentral software. I directly manage the global gaming sales and technical team worldwide. I joined TransAct in 2005, and it has been an honor to be a part of this company that continues to grow and set itself apart in the gaming industry. Please explain what is TransAct, and what the company does? TransAct Technologies is a global company that develops software-driven technology and printing solutions for high-growth markets, including casino and gaming, lottery, restaurant solutions, point of sale (POS) automation, and oil and gas. Thanks to millions of printers, software, and terminal installations throughout the world, our top-quality labels, receipts, tickets, and coupons can be found throughout the Americas, Europe, Asia, the Middle East, Africa, the Caribbean Islands, and the South Pacific. Who are some of the partners with whom TransAct does business, and what kind of services do you provide for them? We have a multi-prong go-to-market approach at TransAct for the Casino, Gaming and Lottery markets. We sell our printer hardware, firmware, accessories and parts directly to manufacturers of EGM, VLT, and lottery terminals. In addition, we call on casinos to educate, inform and create demand for our Epic line of printer products and the Epicentral software system that allows casinos to communicate directly to players while they are playing at the slots. TransAct also partners with strategic distribution partners around the world. Our direct representatives work with local partners to ensure our shared customers receive the best possible customer service and support in their time zone or geographical region. What has been the most successful approach employed by TransAct for business relationships with gaming-resort destination properties? We have been fortunate to build long-term relationships with so many global casino group customers over the past twenty plus years. Many of our customers started working with us using our roll-fed printers even before ticket-in, ticket-out (TITO) technology was adopted and have been loyal users of the Epic 430, Epic 880, Epic 950 and now the newly launched Epic Edge. We are grateful for the relationships we have built with casino groups worldwide, such as Caesars Entertainment, Wynn Las Vegas and Macau, Penn National, Resorts World / Genting in the U.S., UK, Hong Kong and the Philippines, The Hippodrome, Galaxy Entertainment, SJM Macau, MGM Macau, and Melco in Macau, Greece, and the Philippines. How is TransAct positioned today – in today’s competitive business environments? Thanks in part to our immense success with the Epic 950 ticket-in/ticket-out (TITO) printer, which launched in 2005 and is now considered an industry standard, TransAct continues to stand out as a leader in the casino printing industry. The numbers reflect our place in the field with continued year-over-year market share gains, generating a 62 percent year-over-year growth in our casino and gaming sales during the 2018 third quarter alone. We also continue to set the bar high with the launch of the Epic Edge– the only 300 DPI TITO printer in the industry. In the software solutions sector we lead with Epicentral, the only field-proven enterprise software solution that allows the casino operator to get more out of their ticket printers than a cash out voucher across the entire casino floor. In sports betting, the company’s Epic 880 printer is the preferred roll printer that is incorporated into all the leading sports betting kiosks. The Epic 950’s reliability and efficiency has set the stage for the next-generation casino printer, which is the Epic Edge. The Epic Edge is truly one of a kind because it features a 300 DPI print resolution that delivers a 50 percent improvement over all current casino ticket printers. This upgrade provides an increased acceptance rate and razor-sharp barcodes. 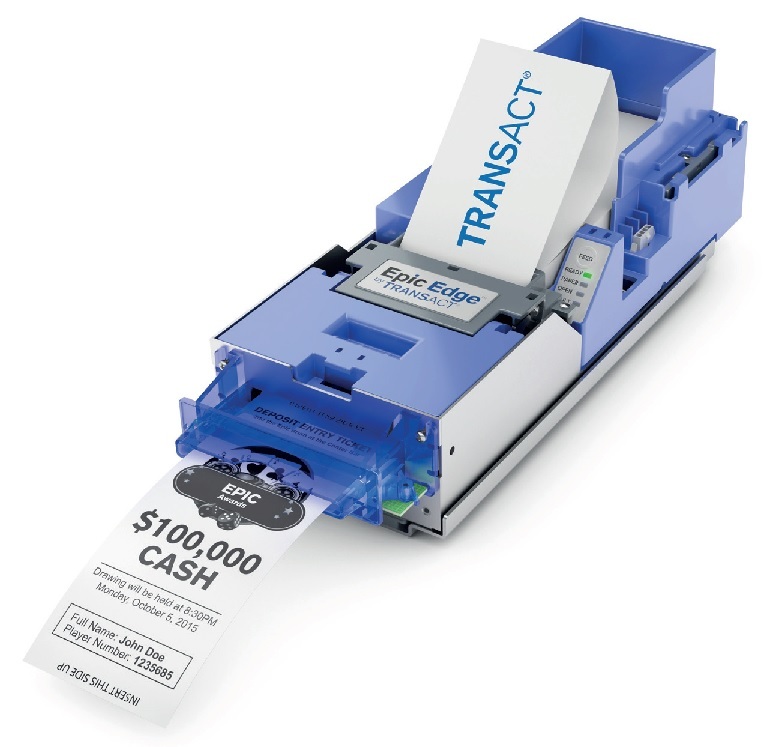 The printer is currently being tested and rolled out by EGM OEMs, and we are confident that these features will demonstrate why TransAct remains a competitive company in the industry. With sports betting steadily on the rise in America, we are pleased to say that casinos are installing TransAct’s Epic 880 printers, which are used in established sports betting markets across the world. The latest installation can be found at the DraftKings Sportsbook at Resorts Casino Hotel in Atlantic City. Known for its reliability and flexibility, the Epic 880 is used extensively across gaming sectors where the most dependable, robust product is required. As the number of jurisdictions approving sports betting expands in the United States, TransAct looks forward to continuing to lead the path in this exciting gaming sector. What would you say makes TransAct unique as a choice in these fields – in Las Vegas as well as worldwide? At TransAct, we excel in printing. Printers, and the associated firmware and software, are our bread and butter, and our near record quarterly casino and gaming sales reflect TransAct’s continued success in leveraging our industry-leading technology. Our recent introduction of the Epic Edge printer, which brings next-level print resolution to gaming floors worldwide, highlights again our commitment to lead this market through consistent innovation and unmatched reliability both locally and worldwide. How have the TransAct products and services evolved in recent years? I would say our most prominent product evolvement is the Epic Edge, our latest iteration of the casino TITO printer. The Epic Edge was built on the proven, long-term performance of the Epic 950, which is currently installed in over 750,000 slots throughout hundreds of casinos worldwide. How has TransAct developed over the years in its ways of providing support options to its clients? Because we have clients from all corners of the world, we are committed to providing support to each region. In addition to partnering up with TBG in Australia and APE Macau in Asia, we have also made some great strides in Europe. In the past year, we launched a European direct sales team to better address our customers in the area, and we also expanded our warehouse in the United Kingdom to provide fast, just in time delivery, and quick turn product repairs when needed. 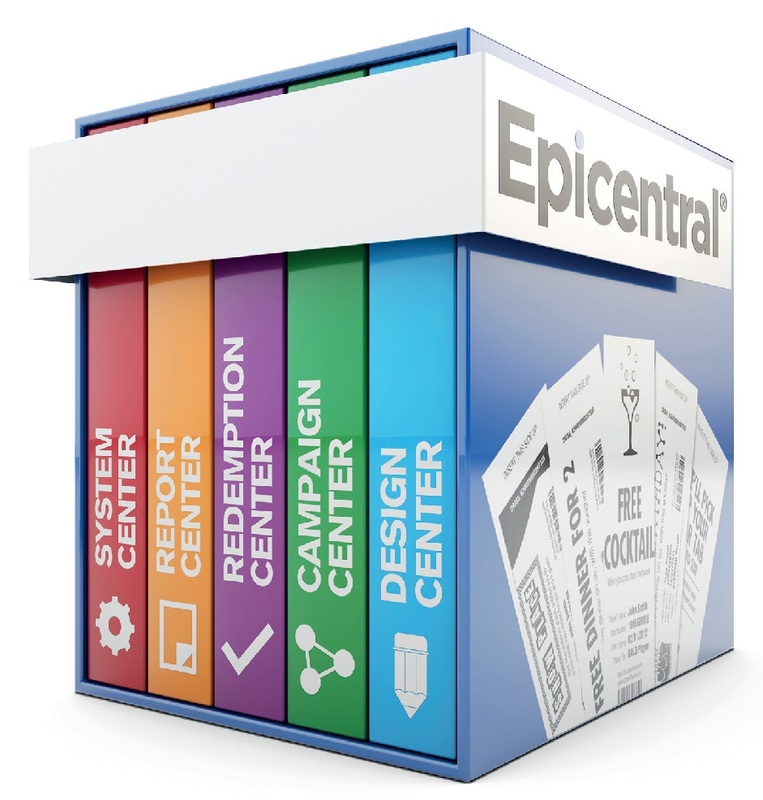 Additionally, since 2015, we have doubled the size of our software team in Las Vegas to further develop Epicentral. We are also happy to say that David Block, TransAct’s Senior Vice President of Software Engineering, received VEGAS INC’s 2018 Top Tech Exec Award in the public business category, further showing the great success that TransAct’s software team has garnered in the past few years financing, innovative inventory management options, and trade-ins on our own and competitive products. Our representatives welcome the challenge to work closely with our customers to land on the right set of product and financial solutions for them. We pride ourselves as being a nimble company that can respond quickly to our customers’ changing needs. Quality and affordability have been two key words associated with casino resorts for a long time – how does TransAct assist their gaming clients in providing such value to their guests? The quality and value of our products is stellar. We are happy to report that the Epic 950 printer is so reliable that less than .03 percent of casinos have experienced any sort of failure with the printer during our initial warranty period, and many of our casino installations have used our printers without fail for 10 years or more! We also set out to make products that are cost-effective. The 62 percent year-over-year increase and 50 percent year-to-date rise in casino and gaming sales are clear indications that the value we provide customers has never been higher. How would you sum-up the future for TransAct in Las Vegas? And elsewhere in the world? TransAct’s plans for the future are well established, both in Las Vegas and around the world. We continue to expand our Las Vegas facility bringing more software engineers into our Software Center of Excellence, and we continue to expand our global sales, operations, and technical support staff in our European and Asian locations. We are excited about our product road map for both hardware and software with an emphasis on growing our software solutions to maximize the value of our printers for our customers. Our leadership team is strong with over 100 years of combined experience in the Casino, Gaming and Lottery industries. In short, our future has never been brighter! In your career, what would you consider to be the highlights? The greatest satisfaction that I realize from my career is always related to the long-term relationships that I have built over time with customers, partners, and co-workers. On the customer front, I derive a great deal of pleasure in helping casinos achieve their goals of revenue growth and guest loyalty. There is nothing better than seeing an individual customer receive a promotion as a result of a program that we have helped them develop. For our partners, I strive to be a reliable, fair and, responsive representative of our company while helping them achieve their goals. From a co-worker perspective, I am only as successful as my team is. I thrive on their wins, celebrate when they hit their targets, and strategize with them on their careers. I have found the most success and satisfaction when I focus on the team’s success. Thank you, Tracey, for your time, and for sharing this with us, and the readers of Casino Life magazine.